Temperatures are rising and university courses are wrapping up. Soon, our friends in elementary, middle, and high schools will be out for the summer as well. Because I work with young people, my life pretty much revolves around the school year schedule – so it is around this time of year, when I see the word “May” on my calendar, that my mind turns to summer reading. There is something magical about summer reading, and it’s hard to pin down exactly what makes it so wonderful. For me, it has to do with the freedom from required reading. I don’t have to read for school, and I don’t have to read as many articles related to my work. I feel the freedom to read books that are more frivolous than what I would typically read. A book that at a different time of year would never make it into my to-read pile is fair game for summer reading. Filling in gaps. I have some glaring gaps in my reading history. There are books that everyone in my friend circle has read and loved that I simply don’t know anything about. I’ve never read A Wrinkle in Time, for example. (Fellow kidlit lovers always gasp in horror when I admit that.) With 2012 being the 50th anniversary of the book and a gorgeous commemorative anniversary paperback available, this might be the summer when I fill in the gap and finally read that book. Diversifying my reading. Although the Diversity in YA blog’s Diversify Your Reading challenge concluded at the end of last summer, I still feel that summer is the perfect time to diversify my own reading. My goal is to read more books featuring Latina characters, because I need to read more books with characters that have backgrounds similar to the kids I work with. The Bermudez Triangle by Maureen Johnson is one on my list, as well as Under the Mesquite by Guadalupe Garcia McCall. Catching up on new releases. So many intriguing titles came out this spring that I just didn’t have time to read, and I want to read them this summer. New titles that I’m planning to read include: The List by Siobhan Vivian, Remarkable by Lizzie K. Foley, Take a Bow by Elizabeth Eulberg, Purity by Jackson Pearce, Thumped by Megan McCafferty, I Hunt Killers by Barry Lyga, and A Greyhound of a Girl by Roddy Doyle. Revisiting old favorites. Summertime is a great season to re-read the literary equivalents of comfort food – those books that you know and love from childhood but don’t mind reading over and over again. Because I’m moving back to the Midwest, I want to re-read some of Laura Ingalls Wilder’s Little House series. And I think that Anne of Green Gables would be the perfect lazy-summer-day-book to read while sipping lemonade, or maybe even raspberry cordial. Working on my lists. I have a few lists of recommended books that I turn to for reading recommendations, and these are great sources of ideas for summer reading. Betsy Bird’s Top 100 Children’s Novels list is a good one. And I always look to the list of 100 Young Adult Books for the Feminist Reader for Slatebreaking reading ideas. Saving extra special books for traveling. When I’m on an airplane or on the road, I want a long book or series that will immediately capture my attention and give me something to savor. Last summer I fell completely and totally in love with the Jessica Darling series while travelling. This summer, I plan to sink my teeth into the Chaos Walking trilogy by Patrick Ness. I’ve heard it’s a great series for readers suffering from Hunger Games withdrawal. I tend to overthink things, so it’s quite possible that you all are out there laughing at me right now. But I bet I’m not the only one who has strategies for summer reading. 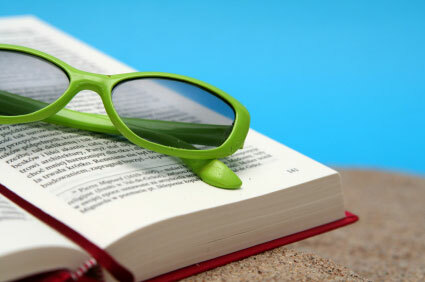 In what ways does your summer reading differ from what you read the rest of the year? What are your strategies for summer reading? What titles are you itching to read this summer? We would love to hear from you – go ahead and comment to join the conversation! This entry was posted in Use Your Gray Matter and tagged leisure reading, Summer Reading. Bookmark the permalink. Why We Broke Up, The Miseducation of Cameron Post, and The Art of Fielding are next on my list! Oooh, I’ve heard such good things about The Art of Fielding…and it’s set in Wisconsin! I just started reading Maureen Johnson’s 13 Little Blue Envelopes this week and I love it. Reading her book is just as enjoyable as following her on twitter.